Your game's too big for the arena - take it to the streets against the city's baddest ballers. Lace up the 'tops and hit the hardcourt with NBA Street, the first in-your-face, arcade-action streetball video game for the PlayStation 2. Clown your opponents with ankle-snapping moves and nasty dunks that show-off your high-flying roundball skills. Rain sweet three's from way beyond the arc, dominate the post with your inside game, or fly high above the rim and slam it home with authority. School Your Opponent, Charge Up Your Team - Boost your momentum meter by bustin' out the moves to make your opponent look like the chump that he is. The more you pour on the humiliation, the bigger the boost. Rake In The Rewards On Every Court - Hit the road in Circuit City and unlock NBA players, streetball legends, and tough street courts. If you got game, you can win cool accessories from shoes to tattoos in Hold the Court mode. Moves That Make You Say "Daaaym!" - Monster dunks and swat blocks, rim hangs and rockin' collisions, and other moves you'll only see on the streetcourts. 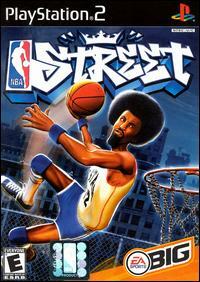 Only in NBA Street can you see such ankle-breaking cuts and unbelievable hang times. City Court Mode - Take on fearsome NBA street teams with Michael Jordan on your side in this level-based challenge. Add your favourite player from the team you just beat - you'll need him to take on the devastating level bosses. Hold The Court Mode - Pick a court and hold it against mixed squads of NBA players. Play against the CPU or another human-controlled team. Your goal: Set the court record for consecutive wins while sending the wannabes home. Personality And Attitude Are The Soul Of The Game - Joe "The Show" Jackson calls the shots and shows no mercy as you take on the greatest hoopsters never to have played in he NBA. From East to West Coast, these are the Streetcourt Legends you have to beat to get to the top. Check Out These Animations - Some of the best ballers in he country showed off their sickest stuff in the EA SPORTS BIG mo-cap studio. Only PlayStation 2 can deliver these results. The Best Courts Around - From the rooftops of LA to the snowy streets of Boston, from inner-city blacktop showdowns to sun-soaked b-ball brawls by the beach, these are the toughest and hippest courts around. Play on REAL courts like New York's Rucker Park and "The Cage".